Richard and Heather called for action by the South Sutton, Cheam and Belmont Local Committee to support our Thameslink campaign, when initiating a debate at the committee on 11 October. 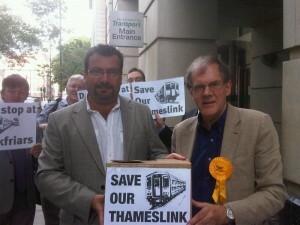 We drew attention to the submission we had put in on behalf of local residents (go to the category of posts called “Thameslink Campaign” to see our submission) to the recent Department of Transport consultation. Councillor Mary Burstow drew attention to her submission. We know that many of our residents, with our proximity to Sutton station being a reason to live in our Ward, commute into London every day to work. Richard and Heather themselves did this for many years. Some commute to north London and the proposal to terminate Sutton’s Capital Connect trains at Blackfriars will add more than ten minutes in each direction to their daily commute, almost two hours extra down time a week. Taken with the effect of cutting us off from international services at St. Pancras, and Luton airport, and the fact that our ability to attract businesses to Sutton has been greatly enhanced by our good transport links, this proposal has to be resisted. The most recent stage in what will be a battle with further, continuing stages was the combined Thameslink franchise consultation on which responses were required by mid-September. Richard commented, in the discussion “The reputation of civil servants at the Department of Transport, following the West Coast Main Line fiasco, is not high, and having worked there during the time that I was chair of the Channel tunnel Safety Authority, I am not altogether surprised. We will need to be vigilant in watching and contributing to the further steps in this process. Richard made some suggestions to prepare ourselves for the further stages. “First, I suggest that all those Councillors who put in submissions send them to the secretary so they can be included – along with his helpful note – with the papers for this meeting, so they are on the record to be used as necessary as an information quarry in further stages. Second, we should consider, if it is appropriate at a later stage, passing a motion drawing attention to the difficulties this proposal causes for our residents, and send it to the Secretary of State, and seek a reply.